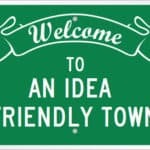 Need ideas for a small town small business? We have an ebook for you. 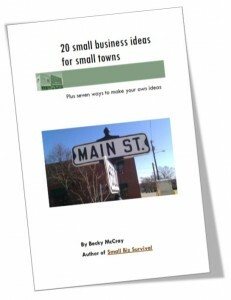 20 Small Business Ideas for Small Towns is a short ebook detailing 20 different ways you can make a successful business in a small town. It also covers seven ways to generate your own ideas, so you can dream up the small biz idea that best fits you. 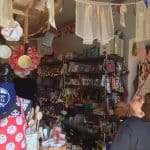 To save it on your computer, right click on this link: 20 Small Business Ideas for Small Towns and choose Save Target As. For Firefox or Chrome users, choose Save Link As. If you want to purchase paper copies in bulk, just contact me. Want more practical steps you can use? Join me and thousands of rural friends sharing a positive view of rural business and small towns. 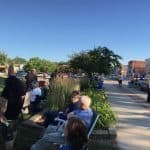 You’ll get the Small Biz Survival articles that you see on this site and you’ll get A Positive View of Rural, our weekly newsletter with practical steps to shape the future of your town and info about products and services to help you and your town. The Positive View of Rural articles never appear on this site. The only way to get them is via email. I will not ever sell or rent your email address to anyone else, because I wouldn’t like that either. Congrats on your ebook, Becky. About to give it a look-see. Thank you, Connie! 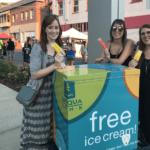 This was a fun project, and one I hope will help other aspiring small biz people. The book is awesome. I hope more people take advantage and download the book. Shashi, thank you for taking the lead in connecting Network Solutions in bringing this book to more small business people all over. Using Google’s free MyMaps feature is a great way to set up a map to show off local facilities, attractions etc. It now shows off photos of the area that are in Picasa Albums. Thanks, Ken, for sharing that great idea! I’ll tuck that away for a future post I’m working on. There are tons of ways and ideas to start a profitable home business. but for the beginner, its tough to know where to start. This looks like a great book to either find an idea or spark an idea that might linger in the mind of an aspiring entrepreneur. good stuff.